Seventh Circle cocktail. Photo: © tablehopper.com. Mendocino sea urchin and herb salad. Photo: © tablehopper.com. 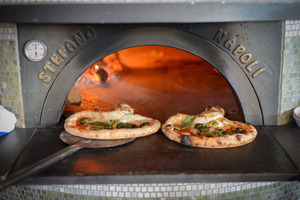 The rachetta pizza, hot from the wood-fired oven. Photo: Charles Villyard. 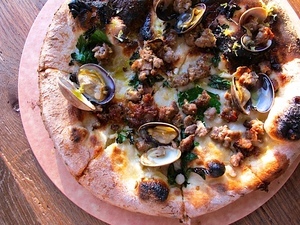 Salsiccia + vongole (sausage and clams) pizza. Photo: © tablehopper.com. The dining room and pizza/chef’s counter. Photo: Charles Villyard. As A16 approaches its 10th birthday in San Francisco (on February 14th), I think about the numerous meals (and stellar Southern Italian wines!) I’ve had there over the years. 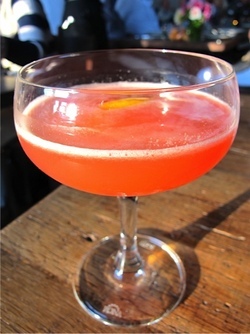 But one thing I’ve never been able to enjoy there is a cocktail (or an amaro), and that’s definitely a must at their newer location, ~A16 ROCKRIDGE~. Just when I’m lamenting the departure of the Seventh Circle cocktail (rye, Campari, Calabrese chile, lemon, and honey), the menu suddenly has the Expatriate Negroni made with sherry to hold your attention, and now, there are five kinds of Manhattans I want to work my way through. The bar is a focal point of this location, always full of diners and drinkers packed in at its 20 feet of Cararra marble and high-top tables. Even if you’re not dining here, it’s a worthy destination for a cocktail before dinner (with bar snacks), or a nightcap. The space has a loftier feel than the original, with high-beamed ceilings, but you can still admire custom pieces of whimsical artwork by Kelly Tunstall, and grab a seat at the counter by the blazing wood-fired pizza oven (always one of my favorite spots). Chef Rocky Maselli’s rotating menu is not about creating a facsimile of the Chestnut Street concept—quite the opposite (although you’ll still be able to get some burrata, purr). 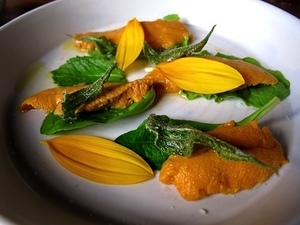 I have found anything in the crudo section to be pretty dang delicious, especially the Mendocino sea urchin ($12; once the set included sunflower petals and fried leaves). Nota bene: seafood really shines here. Ditto the hyperseasonal salads. While the slow-cooked egg bruschetta ($13) sounds mighty appealing, I say save your stomach’s precious real estate (and money) for the well-executed pastas. The shapes change, from chewy paccheri (truly a pasta for pasta lovers) to petite handmade cavatelli (served with mussels one night) to troccoli, a thicker kind of spaghetti that hails from Puglia (chef Maselli has Pugliese roots, so you’ll see dishes on the menu that are more from the eastern side of the A16 autostrada). Small pasta portions run $11-$13, while full-size portions are $19-$21. I am also happy to see potato gnocchi here instead of the omnipresent ricotta version, which I think are harder to get right, and here they do. You’ll want to make your way through the pizzas, starting with the montanara Rockridge ($17), a pizza you’ll smell before it hits the table due to its smoked tomato sauce (it’s lightly fried as well, so the crust is golden and shiny). The rachetta (“racquet”) ($20) is shaped like a tennis racquet (originally made by Starita in Naples), with a twisted handle that has ricotta and other seasonal ingredients tucked into the “handle” like a mini calzone—it’s the ultimate two-cheese pizza (the rest has fior di latte mozzarella). Leave it to the A16 team to do their intensive research trips, study other kinds of pizzas in Naples, and then riff on them here. While wine director and owner Shelley Lindgren has to cover three locations (both A16s and SPQR), it stands testament to their awesome training and staffing that you’ll get the on-point pairings you do here—and education (if you want it). I always leave with at least three new wines written down that I want in my life regularly. I also have to mention the amazing leg of lamb roast ($28) I had one night—the thick, pink slices were downright succulent, with a salsa verde and baby radishes adding bright acidity to the dish. If you see lambie on the menu, get it. Dessert: you want the ricotta fritters ($11), oh yes you do. They are also running some specials each night, like lasagna cooked in the wood oven on Tuesdays, you’re welcome. 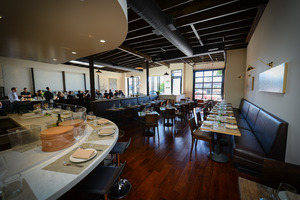 Just added: a three-course Monday night dinner for $29, featuring dishes from other Southern Italian regions. And then there’s Sunday brunch, where I’ve heard you can score housemade sfogliatella (or sfogliatelle, if you plan to eat more than one, like I do). And yet again, I find myself plotting a reason to hop on BART and head over.